A Kotobukiya Japanese import. The hit line of smaller scale Star Wars ArtFX+ Statues is back, and this time it's bringing to life characters from the original films in the all-new Saga Collection. First up is the most notorious bounty hunter in the Outer Rim, Boba Fett (Cloud City Version). 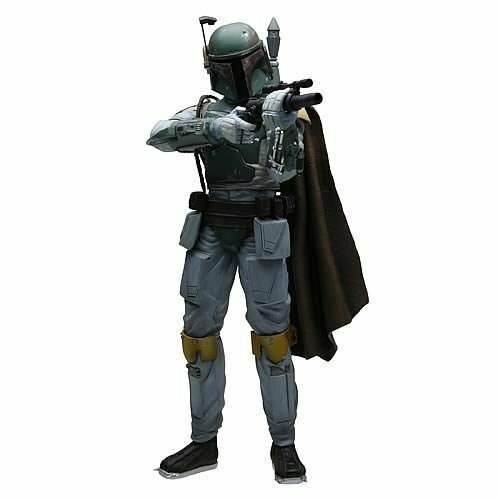 Boba Fett stands almost 8" tall (1/10th-scale) and comes with built-in magnets on the feet allowing the statue to stand along without any dowels. Also comes with special attachment base. Bring to life the memorable Cloud City scene between Darth Vader and Boba Fett.